According to a beautiful legend, Kaliakra Cape is named after a beautiful young girl who threw herself from the rocky shore so she was not to fall into the hands of her oppressors. 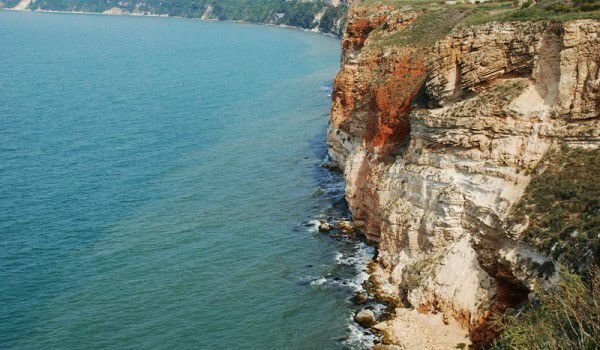 The story says how 40 girls, including Kaliakra, jumped from the cliffs of today's Kaliakra Cape, to avoid being captured by the Ottoman invaders. Another mythological story about this beautiful part of the Bulgarian Black Sea coast, tells how Saint Nicholas, the patron of sailors, fleed from the Turks, and God extended the land under his feet to be able to evade, and thus the nose was created. Eventually St. Nicholas was caught, and today this place on Kaliakra Cape is home to a chapel, which was restored in 1993 in his honor. Kaliakra Cape is one of the most beautiful places along the Bulgarian coast. Kaliakra was declared a protected area because of its great beauty. It is a unique combination of steep cliffs and crystal clear waters. The area is famous for its dolphins and great variety of seabirds that nest on the cliffs. The great wealth of flora and fauna in the region of cape is due mostly to the ecologically clean area free from human activity and therefore is able to retain primary beauty. Extending more than two kilometers of the Black Sea, Kaliakra is known as the longest nose in the Balkans. Kaliakra Cape is situated 72 km north of Varna and only 12 km from the small town of Kavarna. The word "Kaliakra" comes from the Greek word "καλός" (beautiful) and "άκρα" (Fortress). 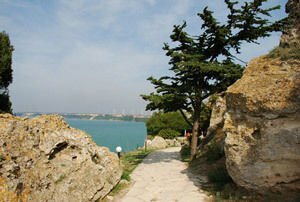 Just 20 minutes from the town of Kavarna, Kaliakra Cape is where you can see archaeological sites, dating from the Bronze Age and an old fortress. 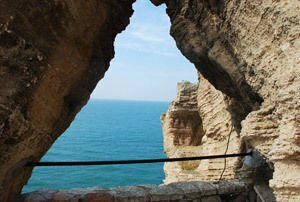 The beauty and historical wealth, which is Kaliakra, attracts there every year more and more tourists not only from Bulgaria but also around the world. Cape itself extends two kilometers into the Black Sea and the height of coastal cliffs, which are predominantly limestone reaches a height of 60-70 m. The main reason for the construction of an ancient fortress called Trisis there is because of inaccessibility to Kaliakra Cape. The fortress was successively used by Thracians, Romans, Byzantines and Bulgarians. Today in the region of Kaliakra you can still see the ruins and remnants of these ancient settlements, most of which are set out in the small museum. In the museum you can learn everything about the area's history through the ages. For the convenience of visitors to the Cape a cafe and restaurant have been built. Moreover, there is the attractive lighthouse marine radar station, meteorological station and, of course, the chapel of St. Nicholas. On the right bank of Kaliakra Cape, the fortress descends to the hall built in one of the caves. The original deck restaurant has 160 seats in the cave and 200 outdoor seats. The second lane leads the tourists to another, smaller cave. The Thracians were the first to have settled in the area of Kaliakra Cape. Thracian tribes controlled this part of the Bulgarian coast, using it mainly for trade to 335, when Alexander the Great, together with his mighty Macedonian Empire conquered the lands on the road to reach the Indian territories. The Macedonians also used the Kaliakra Cape for trading. Kaliakra is one of the first protected areas in Bulgaria, declared a nature reserve in 1941, the reserve extends over an area of 687.5 hectares. Kaliakra is the only reserve in Bulgaria, that includes a marine that is protected for marine areas.